Choosing portable crib bedding and portable crib mattresses deserve a lot of thought and consideration, whether you are using it at Grandma's home or when you travel with your baby. Your baby needs a good night's sleep when away from home. As a mother you know your baby is happier when they get the sleep they need. 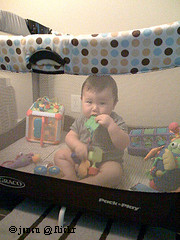 Even away from home your baby needs to remain on their regular schedule and feel rested. You have choices in portable crib mattresses, but you may wonder what you should be looking for. You cannot choose just any durable and firm mattress for your little one. It also needs to be comfortable, offer support, and be safe. Portable cribs are designed to be easy for travel. They are smaller and weigh less than your crib at home. 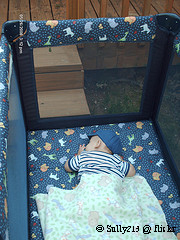 The standard mattress for a portable crib is 24 by 38 inches. It tends to fit most cribs on the market. 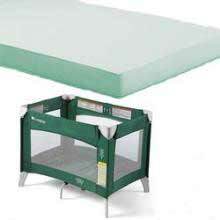 Still, you will want to fit it to the portable crib you are purchasing. You may find when purchasing the portable crib it comes with a mattress. If the mattress does come with the crib you need to look out for the low quality and thinness it may have. 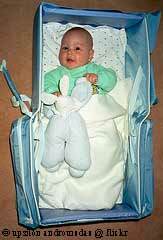 Typically portable cribs are designed to fold up with the mattress ringed around the actual crib. This keeps the entire setup together and closed for easy transportation. Unfortunately the mattress is so thin it does not offer support or safety. Safety as a mother is your number one concern. Even if you have to spend a little more to the proper mattress for your little ones it will be worth it. You will not be able to get a good night's sleep if your baby is uncomfortable or if you are worried about your baby's safety. When I went shopping, I was a little worried about the design. It took me an hour to research the best options, and whether I would need to consider a mattress pad and bedding. After all, part of the safety factor is having sheets that will fit the crib. You never want to have excess sheeting inside the crib. The mattress pad will help make the mattress more comfortable and protect it against accidents. The sheets you purchase will also help in keeping the mattress clean. If you are low on money like I was, the best combination is the portable crib mattress and portable crib bedding. With these two items your baby will be safe and you know they will be comfortable. No matter what you choose safety is first, and size will be second regarding your portable crib and what fits well to make it comfortable.